Start with 8.5”x11” or A4-sized paper. 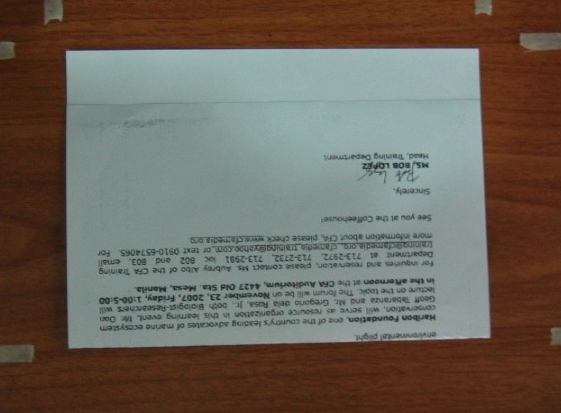 If you are recycling paper, use the blank side for the inner side, to minimize ink contamination inside the envelop. 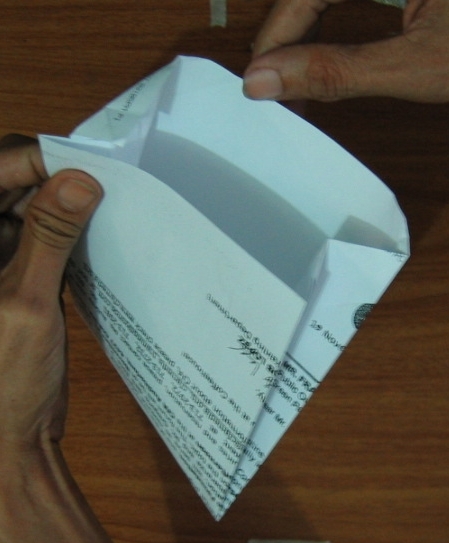 Position the folded paper with the shorter front half facing you and the cover flap on top. We will call this orientation the standard position. Imagine two short 45-degree diagonals starting from the upper corners of the front half, and going down towards its center. 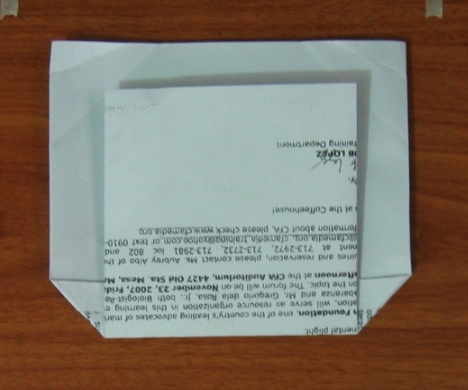 On the cover flap, take each upper corner of the flap and fold it inward (forming a valley crease) diagonally, aligning the side of the cover flap with the imaginary diagonal and creating an acute triangle that points towards the center and somewhat upwards. 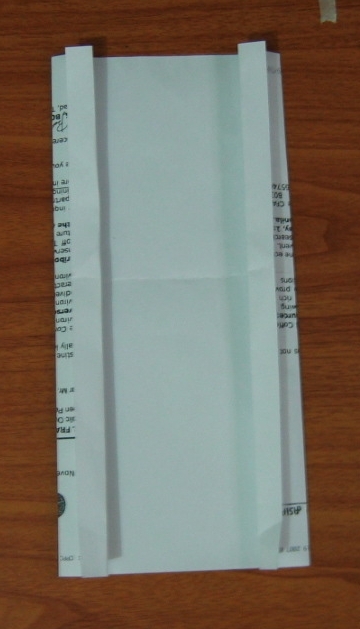 Do not crease along the entire fold. 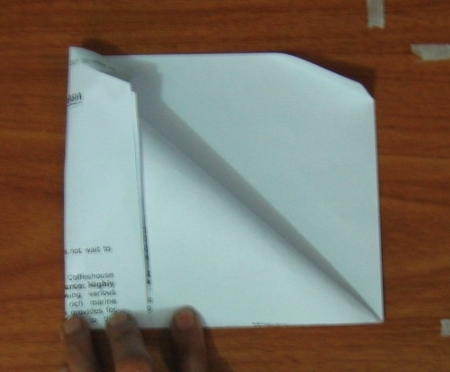 Just pinch a short crease where the fold meets the side of the paper. The final angle of these creases will be adjusted in Step 15. Steps 5-7 will center the front square. Pull the upper right corner of the front face down diagonally, aligning the horizontal side of the triangle formed with the bottom edge. Don’t make a diagonal crease; just note where the corner touches the bottom edge — call it Point X. At the midpoint between Point X and the lower left corner, make a short vertical inward (valley-forming) crease extending from the bottom edge to about half way up. Repeat for the upper left corner: pull it down diagonally, aligning the triangle with the bottom edge. Note where the corner touches the bottom edge. Midway between this point and the lower right corner, make a vertical inward crease extending to about halfway up. 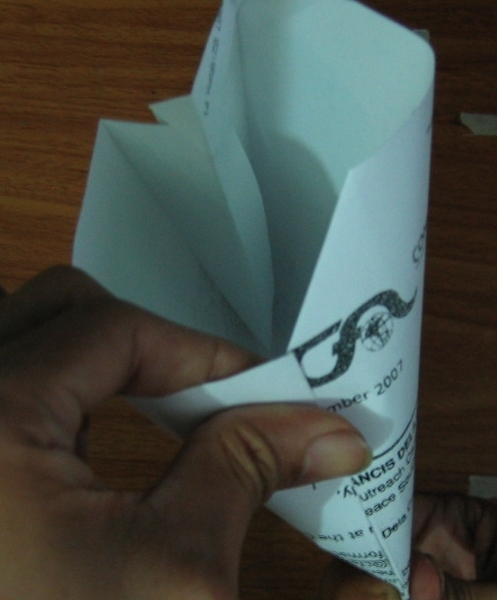 Unfold everything, then fold along the two side creases, in the same inward folding direction as the bottom crease and parallel to the length of the paper, marking the sideflaps. 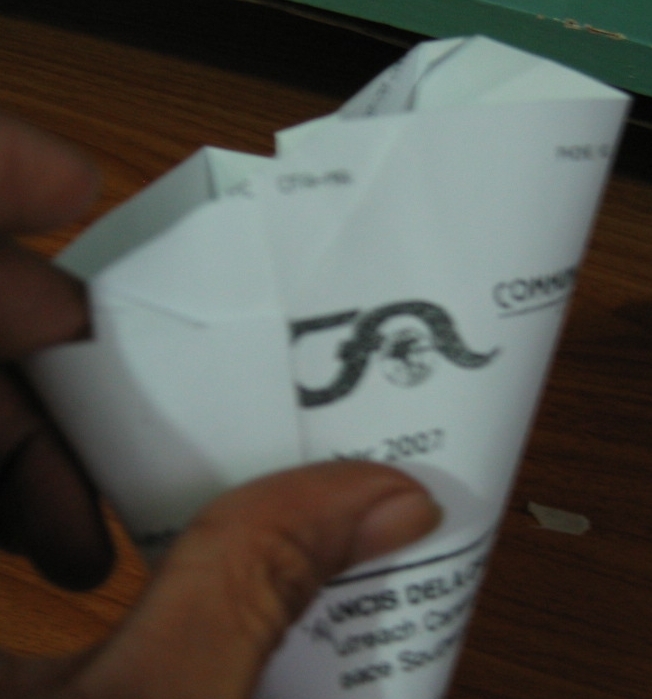 On each folded sideflap, imagine a line along the length, parallel to the side crease, about one-third of the width from the paper’s edge. 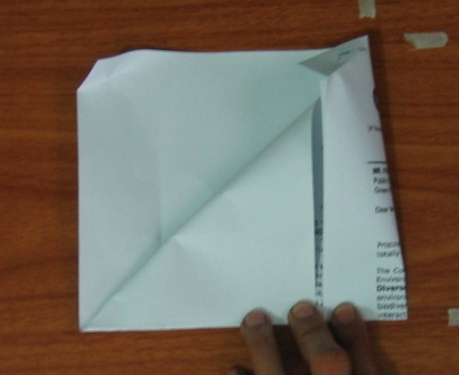 Make a smaller inward fold along this line, splitting the sideflap into two: a smaller portion that is half the width of the wider portion, the paper’s edge appearing to divide the wider portion into two. Keep the edges parallel. We will refer to the two new creases formed as the pocket creases. 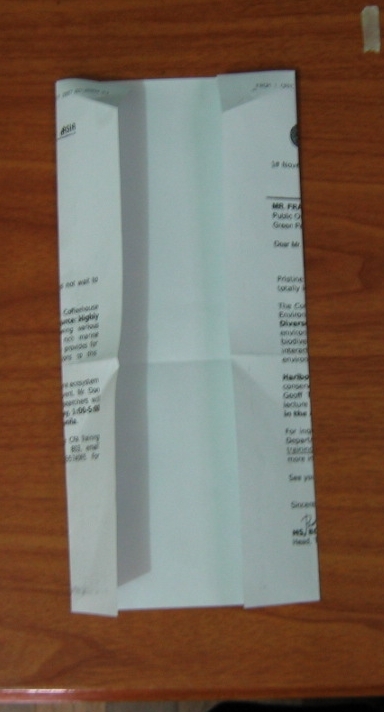 Each pocket crease ends in two corners. One corner is nearer to, the other farther away from, the bottom crease. Take the nearer corner and, keeping the pockets folded, fold (valley-forming) the end of the sideflap diagonally, forming a small triangle. 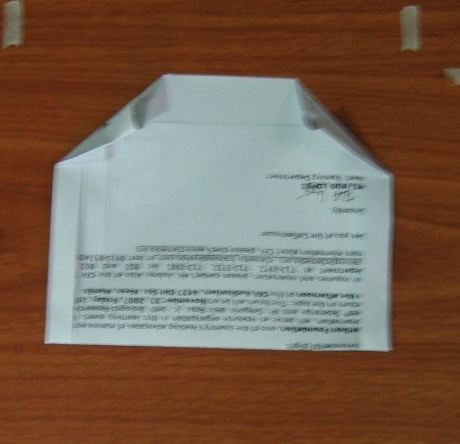 Make sure the side of the triangle is aligned with the side crease. Repeat for the other sideflap. 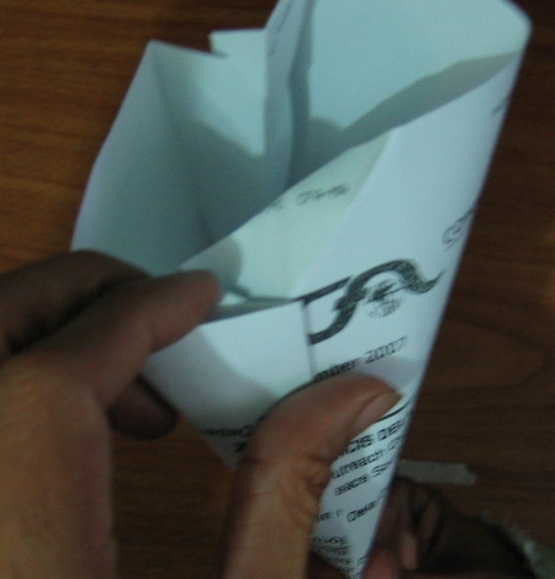 Unfold along the side creases, keeping the pockets folded. Refold along the bottom crease. 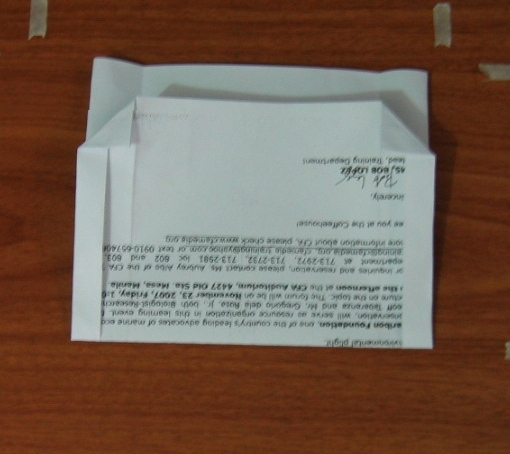 Position the paper with the shorter half facing you and the cover flap on top (standard position). The diagonal folds at the upper corners of the front half should be visible. Take each upper corner of the back face and fold it diagonally inwards along the diagonal of the small triangle, covering the small triangle with a bigger triangle similarly aligned and aligning the horizontal side crease with the upper edge of the front face. 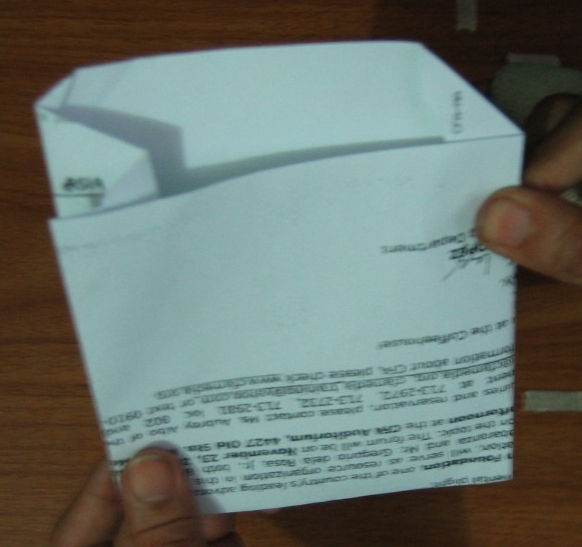 Unfold the small and big triangles. 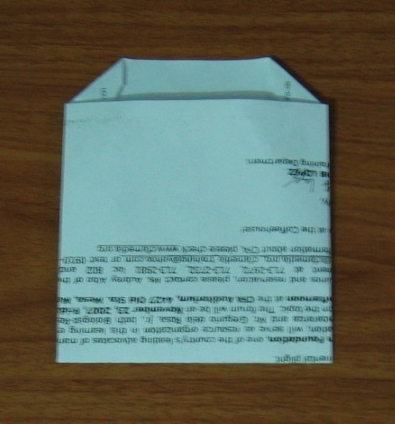 Keeping the bottom crease folded, unfold just the upper portion of the pocket creases on the back face, revealing the full length of the cover flap. 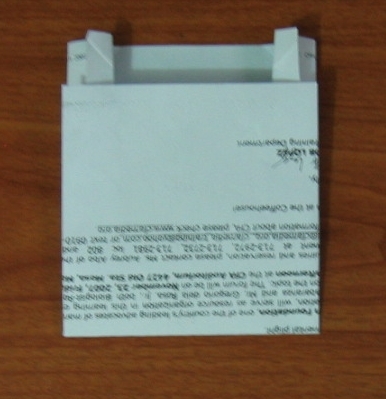 On the top edge of the cover flap, note the three pairs of creases: the pocket crease, the side crease (point B), and the diagonal crease (point C). 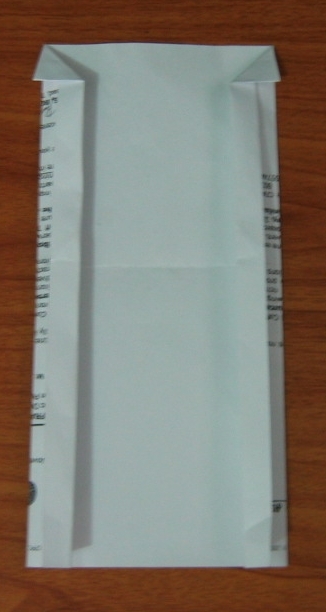 Note also the short creases on each side of the cover flap, made in Step 4. Make a diagonal inward fold along this crease, slightly adjusting if necessary the angle of the diagonal so that it ends midway between points B and C, creating an acute triangle pointing slightly upwards and towards the center. 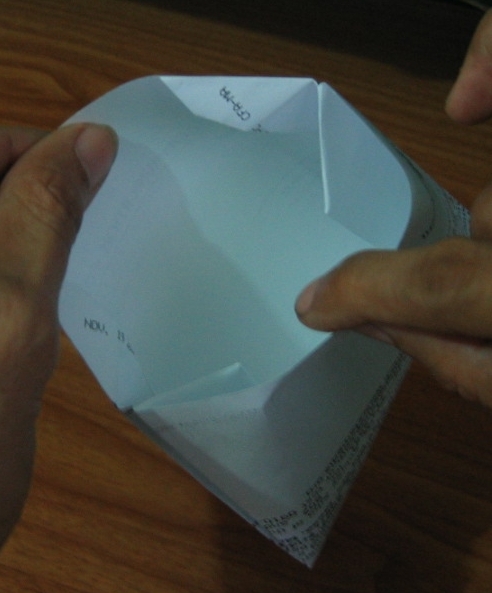 Reinforce the pocket crease over the acute triangle, unfold the acute triangle, and refold the pocket crease. Repeat for the other corner. Keeping the pockets folded, refold the bottom crease, the shorter half facing you and the cover flap on top (standard position). Take each bottom corner and make a small inward diagonal fold, making sure the vertical edge of the triangle formed is aligned with the side crease. 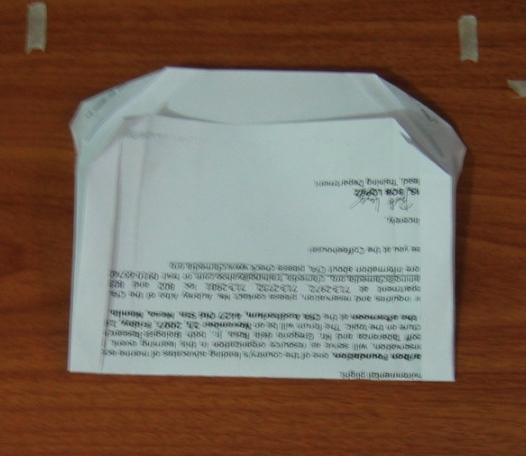 Fold the front sideflaps outward (hill-forming) along the existing side creases, hiding them behind the square front face and exposing the back sideflaps. Fold the back sideflaps inwards, along the existing side creases, and tuck each back sideflap into the pocket (hidden) of the front sideflap. It is better to reinforce the existing creases first, before doing this. On each sideflap, press the pocket crease with \your forefinger from the outside and your thumb from the inside, flattening the sideflap. Refold the acute triangle on the sideflap. This will in effect sandwich the top edge of the front sideflap between the acute triangle and the back sideflap, locking it in. 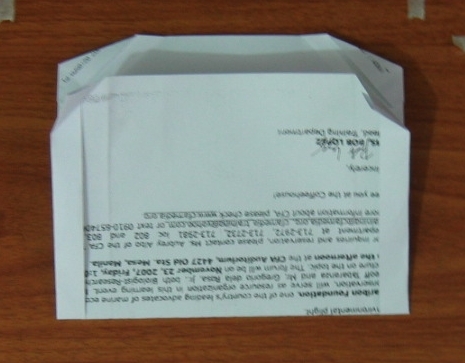 Refold the sideflaps back into a flat envelop. Note the zigzag pattern on the cover flap. Repeat for the other sideflap. 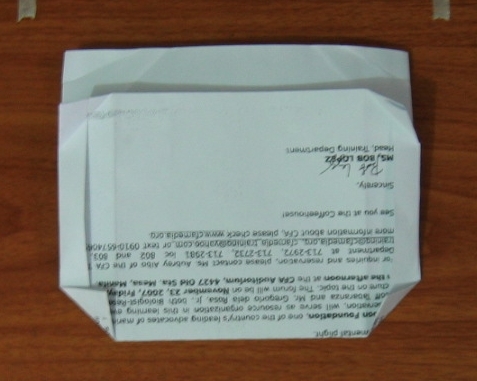 Orient the envelop with a side edge facing you. 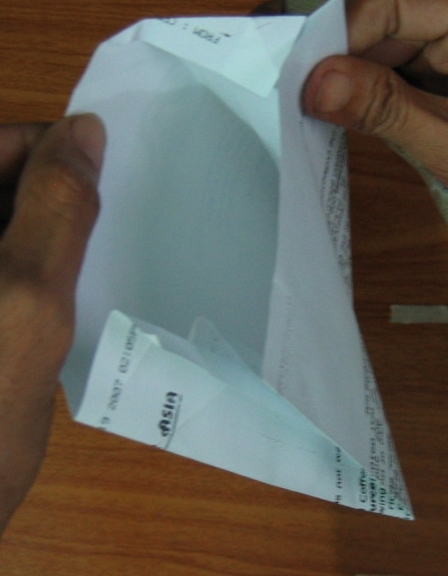 Insert four fingers of one hand into the envelop between the back face and the sideflap. With the thumb, press the side edges together from the outside to flatten the side crease on the back face. 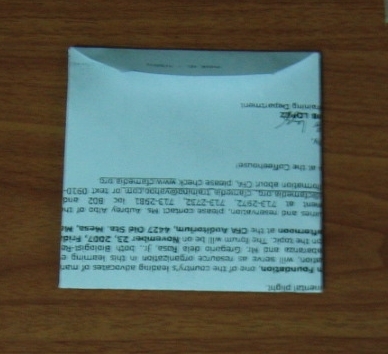 On the cover flap, note the 45-degree diagonal crease, which actually extends (though hidden) into the sideflap inside the envelop. 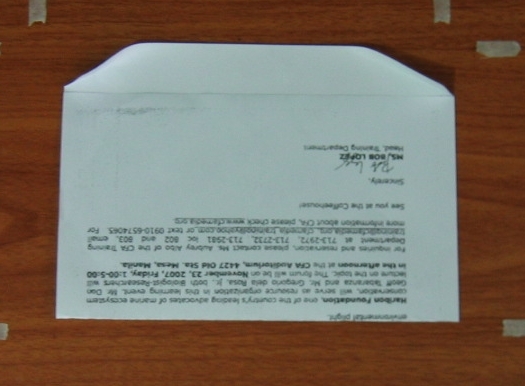 Refold along this crease then flatten back the envelop, reinforcing the creases hidden inside. Repeat for the other sideflap. 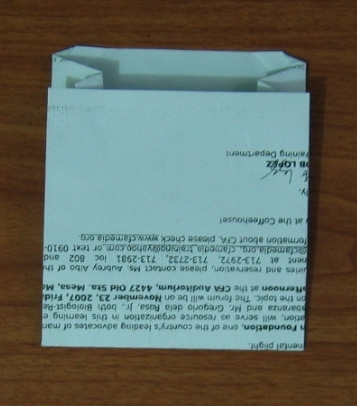 You can insert up to two CD/DVDs into this envelop, using the sideflaps as divider. The second sector is the industrial sector, where workers turn dead matter into finished products through the application of human labor, often enhanced by machines. Here, the human plays the central role. Dead matter will not, on its own, transform itself into a useful good without human intervention. If nature provides us with an incredible variety of living forms, industry provides us wth an equal variety of goods made by human hands. For instance, the methods used in the industrial sector – sawing, cutting, melting, drilling, welding etc. — are appropriate in this sector but not in the agricultural sector. We cannot use on living things methods that are meant for dead matter. We cannot apply industrial methods in agriculture. The industrialization of agriculture through mechanization and chemicalization – inappropriately called the “Green revolution” when it actually drew agriculture away from its truly Green origins – was a huge mistake.